So, it's been a while since I posted here on my book blog. I took a little break a couple of Monday's ago in order to change my blog name and set up all that comes with that on other sites and such, but intended to be away from the blog no longer than a week. Well... That doubled. I kind of just fell out of the habit to be honest, but I'm back, and with a new name - Reading With Jade. My first title was always temporary, but I'm glad to have settled on a name for my blog that I'm happy with and am so excited to be getting back in to the book community - I've missed it! Anyway, on to the reading of this week! I'm currently in the middle of two books at the moment, with my minor one being The Night Guest by Fiona McFarlane. Initially this was to be my one and only current read but I've found it to be the kind of book I appreciate better reading slowly and savouring the story as opposed to speeding through. For my main read I've returned to Diane Chamberlain. Fifteen-year-old Andy Lockwood is special. Others notice the way he blurts out anything that comes into his mind, how he cannot foresee consequences, that he’s more child than teenager. But his mother sees a boy with a heart as open and wide as the ocean. Laurel Lockwood lost her son once through neglect. She’s spent the rest of her life determined to make up for her mistakes, and she’s succeeded in becoming a committed, protective parent—maybe even over-protective. Still, she loosens her grip just enough to let Andy attend a local church social—a decision that terrifies and infuriates her when the church is consumed by fire. But Andy survives…and remarkably, saves other children from the flames. Laurel watches as Andy basks in the role of unlikely hero and the world finally sees her Andy, the sweet boy she knows as well as her own heart. But when the suspicion of arson is cast upon Andy, Laurel must ask herself how well she really knows her son…and how far she’ll go to keep her promise to protect him forever. I love the new blog name! I think it's perfect. I've always been fascinated with everything Disney - I'm sure I'd enjoy that book. I hope you enjoy your reads this week. I haven't read a Chamberlain book in awhile, but I know she's a favorite of many. I hope the book is good! Thanks, Brandie. I'm really happy with it! I wanted something simple but yet portrayed the essence of my blog. It is perfect! Haha. Ah, if you're a Disney lover you should definitely check out that book. It's really insightful but quite inspiring too. Great new blog name! I have changed some of mine over the years (I now have six blogs, down from higher numbers that fluctuated...LOL). I have Disney figurines all through my house, with the biggest one a Fantasia Mickey that sits on the hearth. I loved Before the Storm...and I also enjoyed The Night Guest. Thanks for sharing, and have a great week; and thanks for visiting my blog. Thank you. Wow, that's a lot to keep up with! I have two currently (the other sharing photography) and will soon have three in the new year, and maintaining them all isn't that easy. Haha. When you are passionate about something you make time for it though, don't you?! Sounds like I'm on to two winners this week. Happy reading! 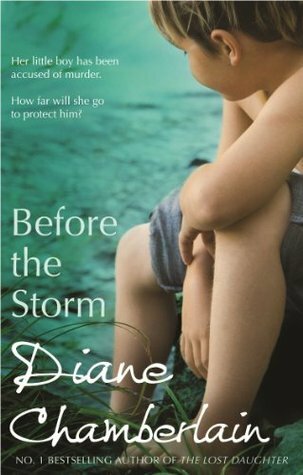 I haven't read this book by Diane Chamberlain. I hope it is good. Pretending to Dance was a bit of a disappointment for me, but I usually LOVE her books. The Night Guest sounds like something I would like. Hope it is good. Have a wonderful reading week, and thanks for stopping by my blog. Ah, that's interesting. I've yet to be disappointed by any of her works, although I have only read a couple. I'll have to check that one out. The Night Guest is proving to be pretty good so far. But the kind that needs some concentrating and thoughtfulness. I enjoyed Before the Storm but then I have liked any of the books I have read by her. Yes it's big work to re organise a blog, hours can just speed by. I've had the same experience with all the Diane Chamberlain novels I've read so far. I only discovered her books recently, but it has been fun delving in to the back log of her works. The Night Guest is on my wish list and I've wanted to read Diane Chamberlain for a while, too! Oh, you should definitely check out Diane Chamberlain's work. I was always put off by the Jodi Picoult comparisons, but then most authors who write contemporary novels that involve a trial or tribulation of some sort seem to be compared to her! I like the new blog name! :) I haven't read either of these books, but they both sound interesting! Thank you! They are both proving to be interesting so far. I have not heard of either of these books - that is the best part of this meme, finding new blogs and new books to read! Have a great week! I agree Erin, that's my favourite part of 'It's Monday' too! I hope you have a wonderful week - happy reading! Thank you! My Diane Chamberlain count is a little less than yours, but I too have been having fun working through her backlist. Haha! We'll see how it turns out first! I was putting off buying it right away but then I saw it in the book section in the supermarket for an unbelievable price and so had to snap it! I'd highly recommend purchasing it! Yay on refreshing yourself with a new blog name! I've changed my blog a few times and even platforms. I"m SO green that you have a copy of the illustrated HP! I know some people aren't keen when you change your blog and such but I think it's so important to find what fits and works for you. Haha! I honestly can't remember the last time I was so happy when purchasing a book - honestly, ear to ear smile. I've only flicked through so far but I'm in love with it!! The illustrated HP is gorgeous, isn't it? I actually bought a copy for my daughter for Christmas. It is all I can do not to pull it out and just keep flipping through the pages. Yes! Oh, what a lovely Christmas present - I'm sure she'll love it. I must admit, I have flicked through it quite a few times already, yet to delve in to reading it though. I read my first Diane Chamberlain recently (Pretending to Dance) and really enjoyed it. So many people loved her books I'm glad I finally got to try one. And congrats on the name change etc. It's great that you recently got to read one of her novels - she's definitely one of those authors you should explore at least once.